Today is the final day of the Avery Elle Inspiration Week and I'm closing out this week with some quick and easy projects! 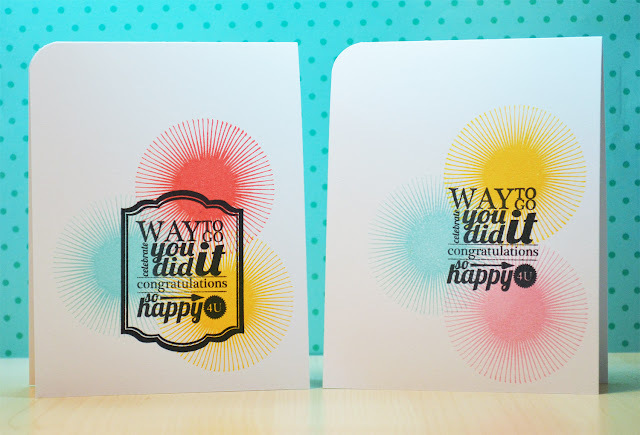 It is Friday after all;) The first 2 cards I want to share were done with the Framed Fonts and Bright Days sets. If you have 5 minutes, you got 2 cards! Done and done. You've already seen the Bright Days set this week, and here's a look at the entire Framed Fonts stamp set! Don't you love that mixed font look? Need another easy project? Let's go! 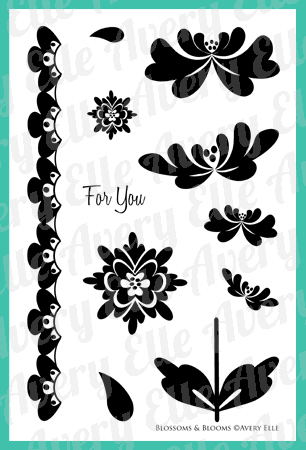 This time I used the Blossoms and Blooms stamps to make a set of gift enclosure cards. I chose the 2 full flower stamps that kind of remind me of medallions. I love that these stamps are not symmetrical. Why does it matter? If you use them to stamp a pattern, the asymmetrical design is very forgiving:) My only tip is to make sure that the stamp is oriented the same direction when stamping your pattern. And here's the entire Blossoms and Blooms stamp set! Lots of possibilities with these flowers! So that's it for me this week! It's been lots of fun playing with these new stamp sets! I really hope that you've found something that speaks to you! As always, if you have any questions about the techniques or products I've used, please don't hesitate to email me! Be sure to check out the other Avery Elle gals for more fun stuff! Your work is divine! I love your eye for design...I can't say enough. I love what you've done today! Great use of color and white space - lovely!! The Framed Fonts are wonderful and I love what you did with the Blossoms and Blooms. 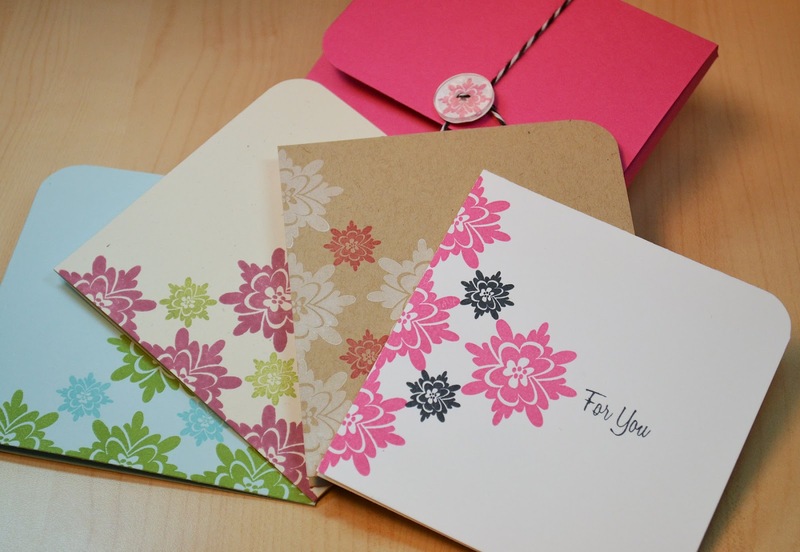 A perfect set of note cards! Thank you for the pdf and cut files! I love how you used the flowers in the Blossoms and Blooms...those blossoms are some of the cutest I have seen! And your Bright days is sensational...Frame or NOT! It is ALL GREAT! These are great! I think I like the first set the best and the one with the frame. Hope you have a fun weekend planned! What fabulous designs! Love your cards. Gorgeous designs and that card holder is awesome. Thank you so much for sharing the cut files for the card holder. Have a great weekend. Yup. So, those are just amazing and I think I want to be you when I grow up. Just say'n. HA! I love how easy you make it look, but it's your stamp positioning and gorgeous colors that bring them to life! Love you you've used the sunburst stamp to create a colourful impact on your cards! Super cute! I love the starburst look a lot! Wow JJ I love all the colors - so many possiblities for that starburst! The sentiment really stands out in the black ink and I am diggin the mixed up font! Love the note cards too - I saw them on the AE Blog - they look quick and fun with a lot of personality! No excuses to not make things ourselves!! Awesome cards JJ! As always! Love the color combo on the first two cards and love that all the cards can be done in so little time. Great cards, JJ. Love each and every project this week! Fabulous! You are doing such wonderful things with these new stamps. My favorite is the new sentiment stamp. It's just beautiful. I love your CAS look but the first graphic card really blows me away. Wowed again! The first set of cards are striking! The second set is wonderful. I love how you used different colored card bases. Simply gorgeous JJ, all such beautiful CAS designs! These are all so fun, JJ! 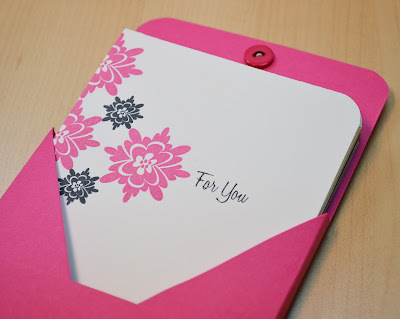 Love how you used the Bright Days stamps to create a pattern and those mixed font sentiments are really cool. Your card set is so adorable and I'll definitely be nabbing the pdf for the card holder. Thanks for providing it! Shaping Up Blog Hop Winner!